Section 46 (I) and section 48 (I) (a) of the Disaster Management Act, 2005, stipulates constitution of State Disaster Response Fund at the State level respectively. 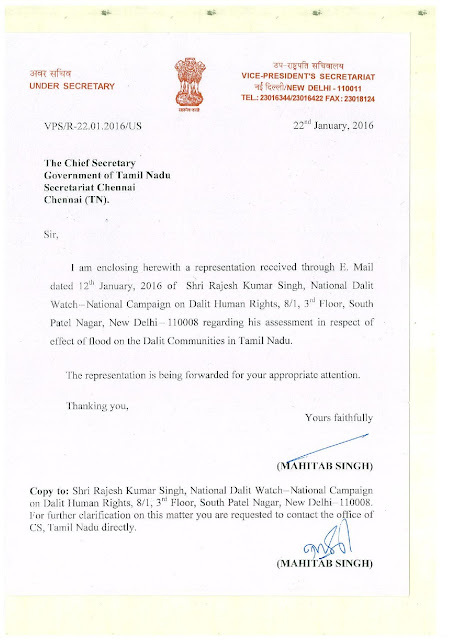 In pursuance to the provisions of the Disaster Management Act, the Government of India has notified the constitution of National Disaster Response Fund. The Thirteenth Finance Commission (TFC) has made provisions of funds for the State Disaster Response Fund in its recommendations which has been accepted by the Govt. of India. 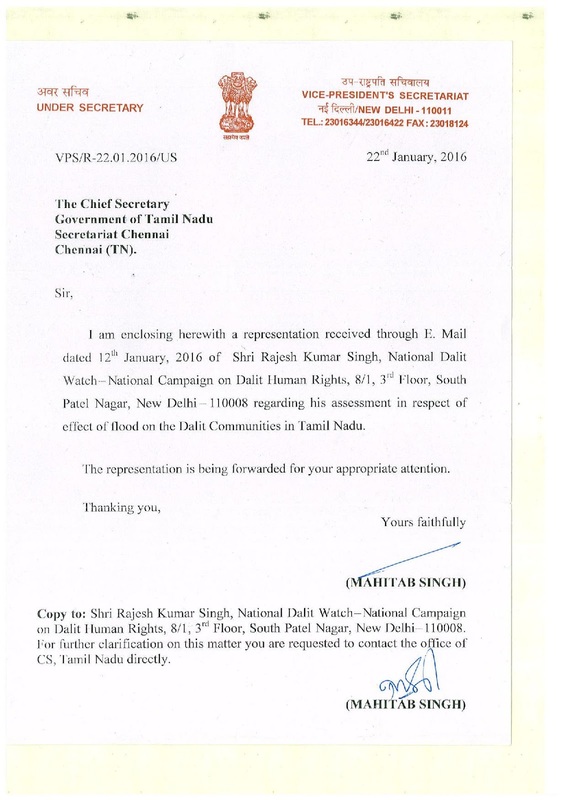 Keeping in view of the provisions of the Disaster Management Act, 2005, and the recommendations of Thirteenth Finance Commission, the Government of India has framed guidelines for administration of National Disaster Response Fund (NDRF) at the national level and for State Disaster Response Fund at the State level, which are enclosed herewith for necessary action. A series of disasters, particularly those in the last decade, have highlighted the degree to which, by virtue of their inherent socio-economic vulnerability, Dalits have been systematically excluded from relief and rehabilitation efforts. In a caste-ridden society and polity as in India, discrimination in disaster response, is highly predictable; discrimination happens by default. Moreover, the discrimination continues to the stage of rehabilitation, whereby, systemic failures to timely map and enumerate the losses of Dalits, further deprives them of claiming their entitlements, which to some extent will help them recuperate. The National Disaster Response Fund guidelines carry the compensation norms for victims of disasters, and have been revised in 2012. These norms are found to be unfriendly and inadequate to the marginalised communities, by making the process of application and claim tedious. Besides the ‘inaccessible’ and ‘inadequate’ nature of the norms, operate only on the principle of ‘Replacement’, lacking the vision of ‘Building Back Better’. These norms fail to strengthen and build resilience of communities whose recuperation depends largely on timely recovery and compensation. 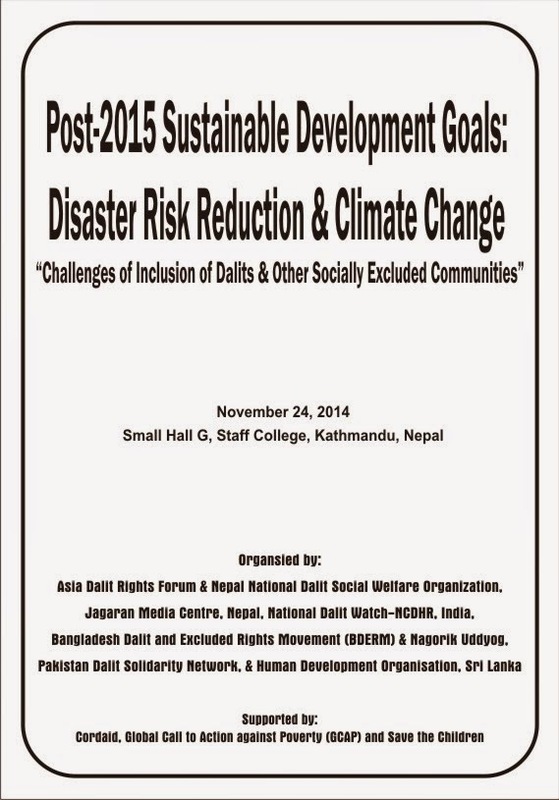 The Hyogo Framework of Action and the development goals (now Post 2015 development agenda) also clearly outlays guiding principles means for achieving disaster resilience for vulnerable and deprived communities for Sustainable Development. However, this can be realized only when the ‘Replacement’ policy is mended into a mechanism of ‘Preventing’ the same losses and damages from recurring by addressing vulnerabilities in time. It is also important to understand the implications of the loopholes in the NDRF from the caste lens, given the context of India. Analysis of the NDRF norms, (hence the Draft Amendments)by the several partner agencies in their local contexts, viz. in Andhra Pradesh, Karnataka, Assam and Odisha, during major disasters, as mentioned above, has exposed several threats and inconveniences faced by Dalits and other most marginalised and impoverished communities in claiming the entitlements. Therefore, it won’t be wrong to say that the compensation set out comes across as inherently discriminatory. The Relief code and CRF guidelines of 2005-2010 which were being followed till the 2012 had serious gaps. The old guidelines have been revised without bridging the gap that previously existed. The revised CRF, now NDRF, defines support for Landowners but not for Sharecroppers where a majority of Dalits fall. There is support for rain-fed agriculture at half of support for irrigated agriculture. The guidelines do not specify any support for land that is not owned privately. Cattle camps and fodder/feed are provisioned but no camps and feed for small ruminants recognised. In 2011, the Odisha Government did announce compensation to sharecroppers, which was a welcome step, but how many were compensated after 2011 floods, remains undisclosed. The guidelines dole out maximum amount of money towards the large animals’ loss, whereas the smaller animals and poultry fetch a lesser compensation package, while some small livestock like pigs and goats don’t find mention in the compensation norms. Small livestock is mainly reared by a majority of Dalit population, due to their incapacity to buy and feed milch animals (those domesticated largely by dominant caste groups). It would also be interesting to look at another scenario where Dalits are forced to maintain the status quo by compensating them only for smaller livestock; while foregoing an opportunity to replace their smaller livestock with bigger ones to improve their livelihood prospects. Discrimination is also inbuilt in the assessments provisioned, which exclude the loss of artisanal equipment, tools and small shops run by Dalits and other marginalised communities. Even the housing compensation perpetuated inequality, for the loss of pucca (concrete) houses manage to fetch maximum amount while the kutcha (thatched) houses and huts receive less attention and money. Needless to mention now, Dalits inhabit these thatched houses and huts by virtue of their socio-economic, situational and locational vulnerability. Taking a position that the poorer will get smaller support and the better off will get larger support goes against the very spirit of humanitarianism. The practice of giving more to the better off also draws upon another fallacious ideology - that of Compensation and Replacement. Some of the best examples of this kind of ideology come from cyclones and tsunami that destroy boast of fishing communities. The government response after the Orissa Super Cyclone was to support the fisher-people to replace the category of boats that they had lost. Five categories were identified ranging from smallest country boats to largest boats (short of a trawler) with outboard motors. The support ranged from less than 10,000 rupees to 100,000 rupees per lost boat. 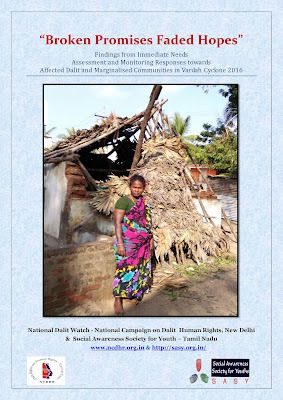 With this background, National Dalit Watch together with other humanitarian organisations and experts felt the need to propose alternate guidelines, with a view to plug in the very evident gaps. Community based processes were followed through village level meetings, and challenges in accessing the existing norms, and experts on the issue were consulted for their inputs. 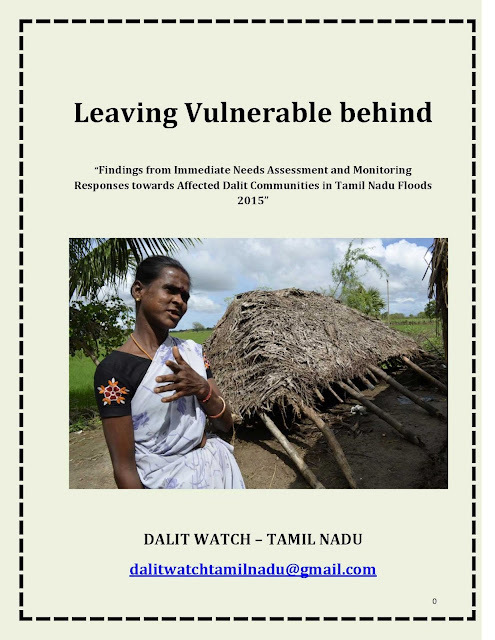 Find here the link to a fact finding report titled ‘Thane Cyclone and Brutal Caste Atrocity against Dalits in Pondicherry and Tamil Nadu’, conducted by Tamil Nadu based organisation, SASY (Social Awareness Society for Youths), in the wake of the Thane cyclone that hit the state in December end. This report once again brings to the forefront, the ongoing atrocities committed against Dalits, (the former ‘untouchables’) even in the backdrop of natural calamities.